AyurvedicYogi » How to give yourself an Ayurvedic massage- free of charge! Used daily, massage can really help us cope better with the stresses and strains of life. This is especially so in the cold, dry winter months or whenever we are feeling our nervous system needs nourishing. Regular massage can allow us to do yoga postures that were previous challenging as it helps ‘prana’ (life-force) flow in the body. This in turn aids ‘ojas’ (Ayurvedic concept of immunity). But who can afford £40 a day for a daily massage- in terms of time even if money was no object? The beauty of an Ayurvedic self massage is that it will only cost you around 20 minutes and a few pounds spent for the right oil for your type. 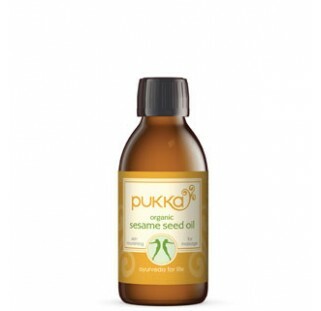 The most commonly used massage oil is sesame (sesamum indicum) which has properties exactly the opposite of Vata dosha. It is rich in oleic and linoleic acids and is traditionally used in Ayurveda as a soothing massage oil. Since the oil is absorbed by the skin its best to use cold-pressed, organic oils. Vata types are best of using sesame, but can also try avocado, castor and flax seed oil. Pitta types can use sunflower oil or the delicious smelling coconut oil as both are cooling. Corn oil is recommended for kapha types, or even using a dry bristle brush for a dry massage for a more stimulating effect. Ayurveda also recommends massage with dry powder to clear excess fluid, help with cellulite and lymph flow. Try using chick pea flour or the Ayurvedic formula Triphala. An Ayurvedic self-massage is best done first thing in morning, and takes about 20 minutes. The ancient texts advised this was done on a daily basis, but you will start to see the effects if you can fit it in twice a week to start with. If time is really short, you can just focus on the head and soles of feet, both of which contain many marma (vital) points that connect with the rest of the body. If a morning massage is not possible, you can do one in the evening but make sure you leave at least 3 hours after eating. Don’t give yourself a massage if you’re not well, have just eaten or during your period. Its very important you don’t get cold during or after your massage so warm your bathroom up by running a bath, for example. Make sure your bathroom is nice and warm- you could even run a hot bath before your massage and enjoy some steam therapy! Warm the oil by placing the bottle in a bowl of very hot water. Don’t use your best towel to sit on as it may get a little oily. Start with applying about 200-300ml of warm oil all over the head and then working down the body. Vata types should use gentle strokes. Kapha types can be vigorous. Start massaging the crown of the head to discharge heat and negative energy. Make small circles from the hairline to the crown. Then up and down the back of your neck. Massage around the ears. Rub the soles of the feet to create friction. Massage balls of feet. Pull and rotate each toe. Then tops of feet and the webs of toes. Use circular movements over the ankles. Use straight strokes over calves from knees to ankle and back. Then small circular movements over the knees. Then straight strokes on front and backs of thighs to knees. Generally, movements are linear on limbs and circular on the joints. Circle over hips and buttocks in outward circles, Start small and let the circles increase in size. Straight strokes from lower back upwards. Use both hands to massage waist from back to front. Place one hand over other to massage navel in small, clockwise circle, gradually making bigger circles. Be gentle on chest and stomach and more vigorous on limbs. Keep hands in this position to massage from navel to left side of waist then up over breast to left shoulder. Massage over rib cage, and from the centre of the chest out over shoulder. Make straight lines from neck out to shoulder, then Straight strokes from shoulder to finger tips. Circle over elbows and wrists. Finish with facial massage, using small delicate strokes. Sit quietly for another 10 minutes while the oil soaks in. Take a warm bath/ shower to wash off toxins drawn to the skins surface. If its a chilly day, wear a warm hat when you go outside after your massage. Marmas are pressure points in the body, similar to the points used in Traditional Chinese medicine. By making gentle circular movements on a marma point, toxins can be released and eliminated from the body. There is an important marma (Shankha) over each of the temples, for example, which can be gently massaged for stress relief. If you are interested in Ayurvedic massage it’s worth finding out more about the 107 main points. The head region has the highest density of marmas which explains why a good Indian head massage alone can be so effective on the whole body. To learn more, I would recommend Ayurvedic massage by Harish Johari. This covers massage oil recipes for each season; massage during pregnancy and of infants; the marmas (vital points) and beauty massage. Dr David Frawley has also written a book entirely on the marma points for those wanting more detail: Ayurveda and Marma therapy by Dr David Frawley, Dr Subhash Ranade and Dr Avinash Lele.